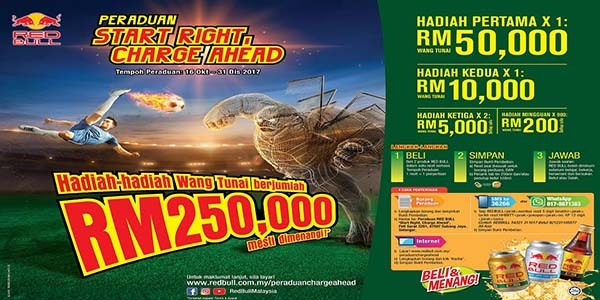 ardour, introduced its ‘Start Right, Charge Ahead’ campaign and announced a corresponding consumer contest, with cash prizes of up to RM250,000 for grabs. Through the campaign, Red Bull hopes to redefine the consumption method of its history-rich energy drink; at the same time, empower consumers to realise their full potential for any task they undertake. 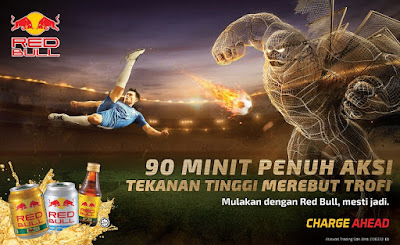 Red Bull endeavours to redefine the most effective consumption manner of its energy drink through the campaign, which is based on the premise that if one starts each activity right, one would find the mental and physical energy to face challenges that may come one’s way and successfully overcome them. Red Bull’s synergy of 11 ingredients results in the brand leading the way in its sector. do they know that Red Bull should, in fact, be consumed before the start of any activity – be it work, sports, studying or driving – so they start the day with the right fuel to perform optimally at any task,”Samathivathanachai explained. An average person’s day-to- day life encompasses work, sports, studies and driving, among other activities. While these activities are routine in nature, they require a sustained level of concentration and can drain one mentally and physically. In conjunction with its ‘Start Right, Charge Ahead’ campaign, Red Bull announced a nationwide consumer contest, with total cash prizes of up to RM250,000 to be won. To participate, consumers only need to buy two Red Bull products; keep the original receipt and the pull tabs; and answer ‘true’ or ‘false’ to a question on the entry form. They will then need to submit their entries through one of four available channels: hardcopy contest form; SMS; WhatsApp; or the Red Bull Contest Website. 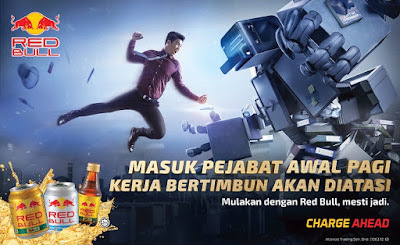 The contest will reward 900 weekly winners with RM200 each; two second prize winners with a cash prize of RM5,000 per person; one first prize winner who will receive RM10,000; and a grand prize winner who will take home RM50,000. The final submission date for the contest is Sunday, 31 December 2017. Red Bull is available at all major convenience stores, petrol marts, independent grocers, supermarkets and hypermarkets at a recommended retail price of RM 3.10 for the original and 25% less sugar canned variants and RM 1.80 for the bottled variant. All images and text that are available on this blog are strictly prohibited for unauthorized reprod. Powered by Blogger.